The platform provides an access to a large set of public biological databanks. Their update is performed and managed with the BioMAJ software package. The raw files are retrieved from remote sites (EBI, NCBI, …) and the processed (Blast indexation, bwa indexation …) in order to be used by different bioinfomatic tools. 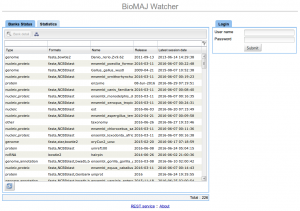 The full list of available databanks and their related information (versions, last update, …) can be accessed through the BioMaji watcher interface. If you need any other databank, or new indexes, fill the bank installation form.